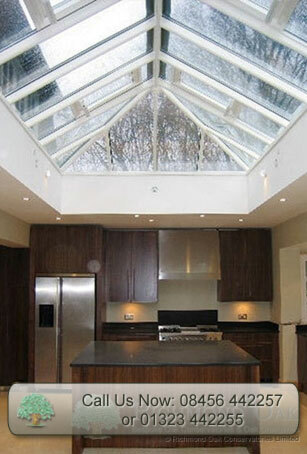 There is something unique about the effect of the roof lantern over a kitchen orangery extension. During the evening the use of low-voltage or, LED ceiling lights, combined with the concealed lighting within or below the kitchen units can create a unique, almost magical ambiance. Just the right environment to host some guests for a drink, whilst you complete the preparation of an evening meal… and have that glass of wine yourself too, of course! The roof lantern in a kitchen orangery enable you to enjoy natural overall light, or where you choose. One large roof lantern can flood a kitchen with light like an atrium; while multiple roof lanterns let you focus light on work, dining or seating areas. Together with the light from the glazed walls of your orangery, the kitchen will become a bright airy space and the focal point of your home, in which the whole family will want to gather. First is the fact that the combination of the orangery partial flat roof and roof lantern may make it possible to have a glazed roof where a conservatory isn’t practical. The glass of the roof lantern is approx. 600mm (24″) above ceiling height and can make a room with a low ceiling height look extremely spacious. Provision of opening roof vents enable the trapped warm air and moisture created within a kitchen to escape through the lantern. Roof vents can be manually operated or more frequently automatic, operated from a climate control and external rain sensor. Sometimes site lines from upper windows and access to these windows and the roof lanterns for cleaning may also influence the positioning of the lantern.